Rinse and drain black beans. 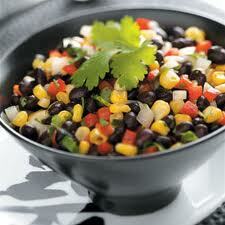 In a large bowl, combine beans, corn, pepper, tomatoes, celery, green onions, salad dressing, and picante salsa. Cover and chill 4 to 48 hours. Stir once or twice. Top with onion slices. Yield: 16 servings.